There’s no getting away from it, learning to drive is an expensive process, both financially and emotionally. The average learner driver needs approximately 40 one hour driving lessons before they are ready to take their driving test and when you consider the emotional investment that learner drivers make too, it’s no wonder one of the top questions asked by prospective drivers is, how do I pass my driving test at the first time of asking? There is no magic formula that guarantees you’ll pass your driving test at the first attempt, however there are some concepts that if applied correctly on the day, will significantly improve your chances of passing your driving test at the first attempt. Due to the cost of booking your driving test, hiring a car on the day and paying for an hour of practice before your test, the actual cost of the exam can exceed £150. For many learner drivers this is a significant expense for one day and because of this cost and a reluctance to pay it twice, they place a significant amount of pressure on themselves to pass first time. Creating additional pressure on a day which is nerve wracking enough as it is, increases the chances of the student failing and ironically enough, removing the pressure to pass first time, often leads to more first time passers. One of the subtle things an examiner looks out for during a driving test, is how confident the student driver is behind the wheel. Examiners associate confidence with safety and as the main objective of the driving test is to asses how safe a driver you are, exuding as much confidence as possible, certainly improves your chances of passing your driving test first time round. Pupil confidence doesn’t mean a quick of a flashy driver, but someone who is control of vehicle and the immediate environment surrounding it. It can be difficult to appear confident when you’re not, however one way of doing so is to converse with your examiner as you drive. Speaking to your examiner as the test progresses helps build a rapport, which can lead to both of you feeling relaxed, while creating the of a confident and safe driver. We can’t emphasise enough how important preparation is to passing your driving test at the first attempt. One important way of preparing for your driving test is take and pass a mock driving test. Mock driving test are simulation exams, aimed at assessing how you drive under test conditions and the more of these you’re able to take and pass, in the lead up to you real test, the greater the chance you have of passing on the day. If you want to pass your driving test at the first attempt, it’s important to take your driving test at a test centre with a high pass rate or a high first time pass rate. Test centres with a higher than average pass rate, often indicates that the route prospective drivers are taken on, are easier to navigate. If you’re not strong on dual carriage ways or major roundabouts, conduct some research before hand on test centers situated away from either and book your test there. Selecting test centres with historically high pass rates, or those which an absence of the type of road situation your weakest on, increases your chances of passing significantly. You can decide on which test centre you want to take your driving test at and each test centre has a designated number of routes a student could be asked to drive on test day. Once you’ve decided on the test centre you’d like to take your test at, have your driving instructor take you on the potential routes as often as possible. Familiarising yourself with the layout of the area, drastically improves your chances of passing your test at the first time and if you have the luxury of practicing in a car owned by a friend or family member, it’s a good idea to have them accompany you as continue to get to know the area. You can never be too prepared for your driving test and once you’re confident enough to take your test, you can improve your chances of passing first time, by reading articles and watching videos of the maneuvers you’ll be asked to perform on the day. Of course there’s no better way to practice than actually executing the maneuver yourself, however reading articles and watching videos gives you an extra layer of knowledge and the more information you have on the subject the better. 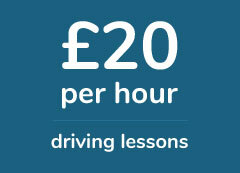 The standard procedure before your driving test is to have an hours lesson with your instructor before the examination. The point of the lesson is to steady your nerves, get you comfortable behind the wheel and have one last practice of your maneuvers. The lesson before your test is important and you can increase your chances of passing your driving test at the first time of asking, by booking a double lesson instead of a single. Two hours practice will ensure you’re completely relaxed behind the wheel, and assuming you do not get tired after driving for that long, you should be comfortable enough to execute all that is asked of you during the exam. Passing your driving test at the first attempt is not as hard as it is made out to be. A significant amount of student drivers are able to pass their test first time round and as long as you practice consistently, prepare thoroughly and follow the advice in this guide, you’ll be in a strong position to pass your driving test at the first attempt.